It was a slightly surreal Monday for the yard, as having had SIR RODERIC lose out in the narrowest of photos at Windsor, it looked as if SIR PLATO (pictured) was also going to be caught as the hot favourite Cuban Heel was closing him down on the run to the line at Ffos Las and a photo was called as they flashed past the line. However, he had indeed held on and it was then announced that the placings had been reversed at Windsor – we ended up with a yard double within fifteen seconds! 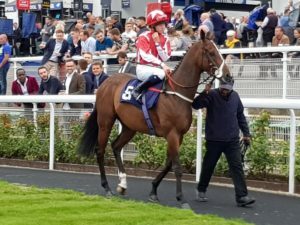 It has been an extremely frustrating time for SIR RODERIC, who had such a successful three-year-old season, winning five races and hitting a peak rating of 97. Last year was tough for him in all the leading heritage handicaps as he rarely had his ideal conditions and despite a couple of decent efforts, he completely lost his confidence. While the mark has tumbled this year, he has travelled well in his races but just not been finishing them off so we decided to take a chance dropping him back to sprinting and putting cheekpieces on. Having had to wait for the gap, he quickened to lead inside the final furlong and looked for all the world the winner but somehow had lost the photo by the narrowest of margins! However, while Gerald Mosse had waited for a gap and switched left into daylight, Jason Watson on Parnassian tried to squeeze through a very narrow gap that wasn’t big enough between Sir Roderic and the third, causing Sir Roderic to lose his hindquarters and some valuable momentum. With the winning distance so narrow, the stewards felt that the interference had cost Sir Roderic more than he had been beaten. With this win on the board, hopefully his confidence has been boosted and maybe we can reinvent him as a six furlong sprinter, especially with lots of soft ground hopefully available in the autumn. It was ironic that it was SIR PLATO who got the yard double as he too had won five races as a three-year-old (two of the same Windsor contests that Sir Roderic won) but although not as classy, he has managed to retain his form at four and was recording his second win of the year when holding on at Ffos Las. He likes to dominate so it was not ideal for Bombastic to be so keen and deny him the lead but he didn’t get crowded and having hit the front entering the final furlong, he battled on gamely to the line to record his seventh career success. A good time to add we have a Sir Prancelot yearling we are syndicating into quarter shares for next season!! Our other two runners both performed very creditably to finish third. There was not enough pace for RAGSTONE VIEW but he stayed on encouragingly to finish third and that was a decent effort as he would prefer a straight track. It was another placed effort for HAWRIDGE FLYER behind a progressive three-year-old in Pentland Hills and he probably wants softer ground at 1m4f but he has been extremely consistent this year.